Plain and simply put, snoring is annoying and disturbs the sleep of others unfortunate enough to sleep within earshot of it. Snoring occurs when the passage of air is hindered due to a clogged airway. Restricted air movement causes vibrations in the throat which creates the sound we all know as snoring. My Snoring Solution Chin Strap is an inexpensive, natural and simple stop snoring solution that works to “unclog” the airway so that air can flow freely- and quietly! My Snoring Solution Chin Strap opens the airway in your throat by holding your lower jaw in a forward and closed position. Supporting the lower jaw during sleep prevents it from falling back and closing off the airway. When the lower jaw is held in a forward and closed position, the muscles and tissues that were once blocking your airway and causing you to snore are no longer restricting airflow. My Snoring Solution Chin Strap will eliminate or reduce the sound of snoring while you sleep by holding your jaw snugly in place. Easy to put on and comfortable to wear, you and those around you can get a good night’s sleep without the use of drugs or a trip to the doctor. It easily stretches to fit over your head and uses two elastic straps to hold everything in place, preventing it from falling off in the night. 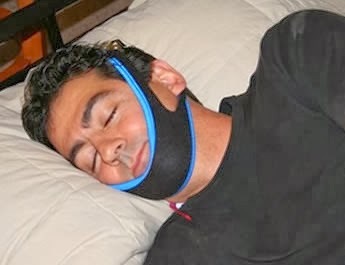 My Snoring Solution Chin Strap can also be easily worn with a CPAP machine. My Snoring Solution Chin Strap can help you get a snore-free good night’s sleep so you can wake up feeling refreshed and ready for the day. Visit www.snoremart.com for information on this product and other stop snoring solutions!